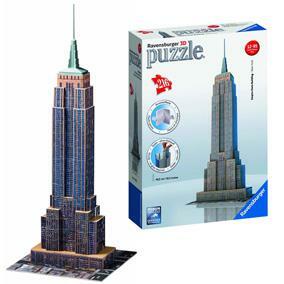 I was recently sent a Ravensburger Empire State Building 3D Puzzle to review. This is a 216 piece puzzle, and all of the pieces are made from plastic – some are hinged, and others are like traditional jigsaw pieces. It has an RRP of £19.99 and weighs 0.5kg, boxed. 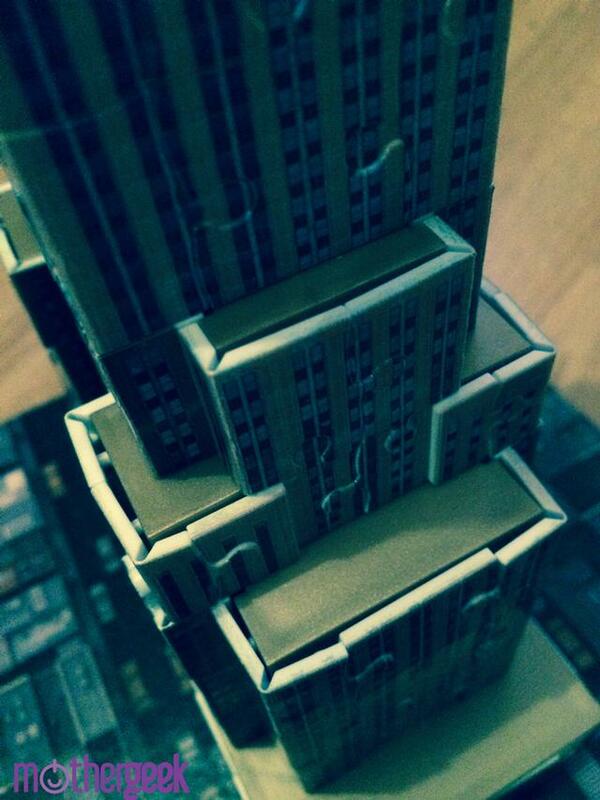 Once constructed, this 3D puzzle measures 42cm x 12.5cm x 5.5cm! Each piece is numbered on the rear so you can find them and follow the instructions clearly. Each piece also has an arrow on it, to show you which way the next piece will attach. I took over at the point shown in the above photo. The image clearly shows how the pieces are numbered and how the arrows show you which direction the next piece will attach. I found it easier to sort the pieces into small batches of 10 (in numerical order), and then just build the puzzle afterwards. This worked really well, until you got to a piece without an arrow on it. It took me a good 15 minutes to realise this meant I needed to add a non numbered piece, or shift to a different place on the structure. 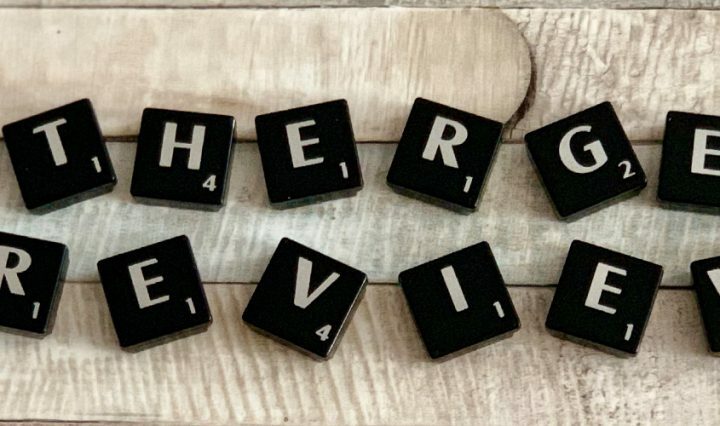 (The instructions are really clear and show you exactly what to do – as long as you remember to look at them)! 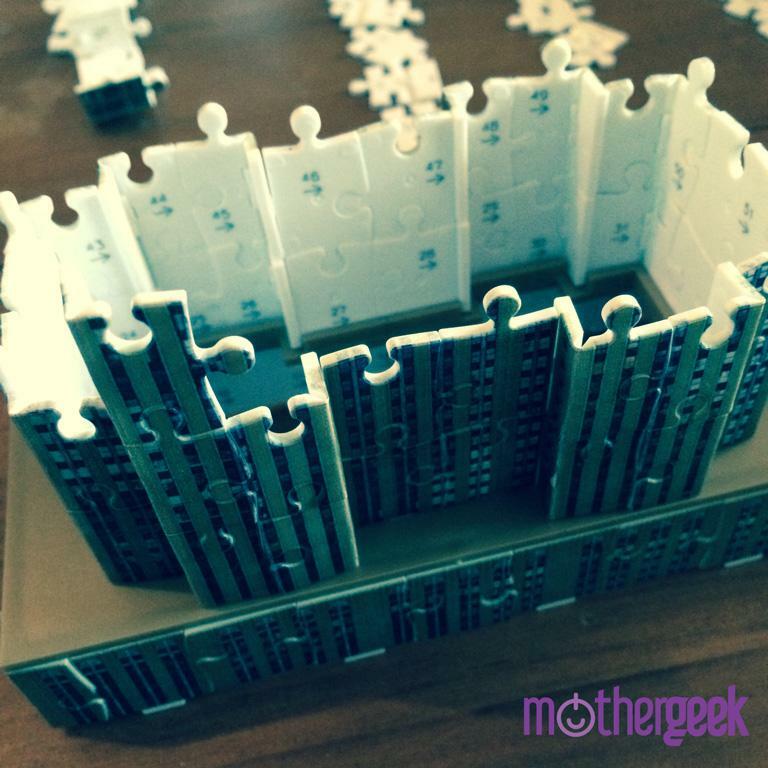 The normal puzzle style pieces fit together really well, but some of the hinged pieces were really awkward. I felt like I had to be gentle with them, but if you didn’t bend them enough, the entire model’s shape would become distorted. After I’d assembled 2/3 of the model, I realised the hinged pieces kind of “pop” into place when they are correctly bent to a 90 degree angle – this made life much easier…. At least until I over-bent one and snapped it, right near the end! Thankfully, the piece was held in position by the other pieces on each side of it, so no harm was done. It was really frustrating when pieces would pop out and disconnect while fitting the solid support layers. If one hinge isn’t bent correctly or pops out, it can take you 15 minutes to get it fixed. All told, it took me around 2 hours to build the model, plus the 30 minutes DaddyGeek spent on it, too. Once fully assembled, it looked like the image above! It really is beautiful to look at. The attention to detail is amazing, and I was surprised at how solid it was once fully built. If you look closely, you can see plenty of flaws, though. As the photo above shows, if you don’t get the hinges exactly right, it is really noticeable up close. You can’t really tell from the front, but when you look down on it, you can see gaps between the pieces and imperfections. A couple of my relatives are fans of Ravensburger 3D Puzzles, and they’ve said that this particular one isn’t a very good starter set. They hinted that despite the age 10+ recommendation, I should have done an easier set first – like the windmill or the Leaning tower of Pisa. With that in mind, I would give the set 3/5. It looks brilliant once built; and despite the frustrating aspects of the building process, I felt very smug once I’d managed to finish it – So much so, it’s still proudly on display in my lounge a week later! I’d recommend it to experienced 3D puzzle builders, but probably not as a beginners set.